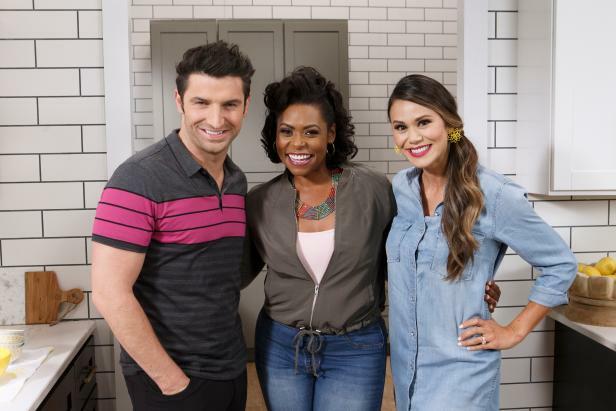 Let's Eat is a new daytime series starting on Sunday, August 12th at 11am ET/PT with co-hosts Brandi Milloy, Stuart O’Keeffe, and Jamika Pessoa. The co-hosts will discuss "flavorful dishes, to popular restaurant trends, and to the latest food fads captivating social media." The will also be "joined by special culinary guests, as well as experts from Food Network Kitchen, as they explore everything that is current in the culinary world, and share tips, tricks, and mouthwatering recipes to make your time in the kitchen a breeze." "Over 13 half-hour episodes, the co-hosts along with special guests take a look at the latest culinary trends, offer up kitchen hacks and time-saving shortcuts, while sharing delicious new recipes for every occasion, including inspired culinary delights from the latest and greatest digital food frontier. In addition to culinary tips, trends and techniques, the co-hosts serve up delicious recipes to make at home; from Sunday brunch to a Saturday night party including an epic take on a cinnamon roll, Super Easy Sloppy Sliders for a do-it-yourself party menu, a weeknight pasta dish using only five ingredients, nachos with a twist and many more. THE KITCHEN Sink will also step out of the studio and on to the streets with Sink on the Street, going on location for a deep dive into popular food trends and the culinary delights they inspire"
If you are wondering about the hosts, they have all appeared on Food Network in the past. Brandi Milloy has appeared on Guy’s Grocery Games, Food Network Star and Chopped Junior; Stuart O’Keeffe has appeared on Private Chefs of Beverly Hills and Chopped; and Jamika Pessoa has competed on Food Network Star and is a judge on new show Ultimate Summer Cook-Off. New York – From flavorful dishes, to popular restaurant trends, and to the latest food fads captivating social media, Brandi Milloy, Stuart O’Keeffe, and Jamika Pessoa are breaking it all down on new daytime series Let’s Eat, premiering on Sunday, August 12th at 11am PT/ET. The trio of food-passionate hosts will be joined by special culinary guests, as well as experts from Food Network Kitchen, as they explore everything that is current in the culinary world, and share tips, tricks, and mouthwatering recipes to make your time in the kitchen a breeze. Food is front and center in each of the half-hour episodes, and every dish is unapologetically delicious. From comforting chicken pot pie with tater tot crust, to decadent bacon, cheddar, jalapeno stuffed hush puppies, and to chocolate mousse in cookie bowls, there is something to satisfy every type of salty, savory and sweet craving. Throughout the season, Brandi, Stuart and Jamika teach innovative cooking techniques to make preparing any meal quick and easy. Plus, they head out of the kitchen to top restaurants discovering the secrets behind their most popular dishes that have gone viral. Come along as they turn food fails upside down, create edible illusions, and mashup your favorite dishes. Growing up in a military family that moved often fueled Brandi Milloy’s love of food, people, culture and travel. Widely known as a food and lifestyle expert, fans have come to rely on her popular blog for easy pantry staple meals and crowd-pleasing recipes. She is best known for the YouTube series POPSUGAR Food: Eat the Trendand Get the Dish with Brandi Milloy. Brandi is no stranger to television, and brings her expertise to the Today Show as a regular contributor. She has also appeared on Cooking Channel’s Eat. This. Now. and Food Network’s Guy’s Grocery Games, Food Network Star and Chopped Junior. Stuart O’Keeffe is an accomplished celebrity and professional chef, known for his hearty but healthy meals. Growing up in Ireland, he first explored his passion for food while cooking alongside his mother. After graduating from high school, he attended culinary school at the Dublin Institute of Technology. In 2016 Stuart released his first cookbook, The Quick Six Fix, which offers no-fuss recipes that are full of flavor. He has also starred on Irish television in Stuart’s Kitchen, and on Food Network’s Private Chefs of Beverly Hills, as a judge on Chopped, and as a featured chef on OWN’s Home Made Simple. Jamika Pessoa is a chef and caterer to the stars, known for bold twists on traditional dishes, especially those of her Southern and Caribbean heritages. Audiences first met Jamika on Food Network Star where they came to know her innovative style, sassy personality, and inspiring tenacity in the kitchen.Since then she has been featured on Cooking Channel’s Donut Showdown, Unique Sweets. Jamika is also a recurring judge on Food Network’s upcoming series Ultimate Summer Cook-Off. On Food Network’s Facebook and Instagram fans can meet the hosts in a series of insider clips, and get their takes on the latest trending food debates. Also, they can learn even more cooking tips and food hacks, watch over-the-top dishes come to life, and use #LetsEat to share their own tricks in the kitchen. Plus, for all the full recipes featured on the show visit FoodNetwork.com/LetsEat. FOOD NETWORK (www.foodnetwork.com) is a unique lifestyle network, website and magazine that connects viewers to the power and joy of food. The network strives to be viewers’ best friend in food and is committed to leading by teaching, inspiring, empowering and entertaining through its talent and expertise. Food Network is distributed to nearly 100 million U.S. households and draws over 46 million unique web users monthly. Since launching in 2009, Food Network Magazine’s rate base has grown 13 times and is the No. 2 best-selling monthly magazine on the newsstand, with 13.5 million readers. Food Network is owned by Discovery, Inc., a global leader in real life entertainment whose portfolio also includes Discovery Channel, HGTV, TLC, Investigation Discovery, and OWN: Oprah Winfrey Network."